Our most fulfilling work is nowhere near a construction site. The structures we build matter, but building community matters more. 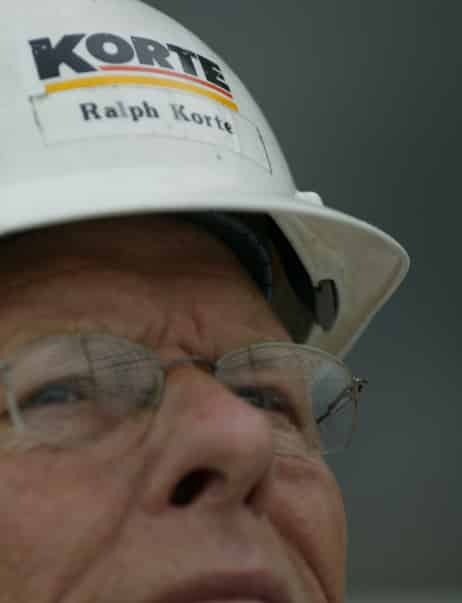 Company founder Ralph Korte’s philosophy was simple: Build high-quality buildings and leave his hometown of Highland, Illinois a bit better than he found it each day. That’s his legacy, and it earned him the reputation that’s stuck with our company ever since. Long-standing support of his alma mater, Southern Illinois University Edwardsville, by helping build a multi-use stadium and creating a construction management academic program funded through a scholarship endowment. More than 25 years as a major fundraiser for Girl Scouts. We want to be a positive force anywhere we do business, and that means getting involved. It starts in our own backyard of Highland, Illinois and the greater St. Louis region. In addition, we forge bonds with other area organizations to execute one-off projects, like the installation of exercise equipment in a local park. We also partner with area schools to bring students to construction sites to help spur their interest in a career in construction. Non-local philanthropy efforts include our ongoing support of the Susan G. Komen Foundation and the Wounded Warriors Project. Our community involvement stretches beyond our hometown, too. Nowhere is that more evident than in our efforts in the Las Vegas area. Ever since The Korte Company established its presence it Las Vegas, we’ve treated it like home. That’s because, in a sense, it is: Greg Korte, Las Vegas Division President, has lived and worked in the area for nearly three decades. He’s led our efforts in the area, including involvement with organizations supporting at-risk youth and involvement with St. Jude’s Ranch for Children. The Korte Company’s long-standing support of United Way charities stretches across our national footprint. The hallmark of our support is the yearly campaign we run throughout the company. In fact, in 2016 alone, we raised $93,000 for United Way by matching employee contributions dollar for dollar. It doesn’t end there. Jay Korte, the company’s Director of Client Relations, currently sits as Board Chair for the United Way’s Southwestern Illinois Division. Greg Korte serves on the Board of Directors for United Way of Southern Nevada and also is a member of the organization’s Tocqueville Society. Our EEO Officer, Susan Bowman, is a member of United Way’s Allocation Committee. Above, we’ve highlighted just a few of the local efforts and national organizations we support. Throughout our company’s history, we’ve benefited from people and organizations who believed in lending a helping hand. That motivates us to pay it forward, guided by a simple belief: If we can help make our communities better for the folks who live there, we should. So we do.